The general cargo regular routes of Enterprise Logistics. 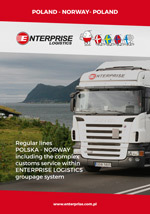 The most efficient Poland – Scandinavia LTL service. We are glad to present you the Enterprise Logistics general cargo service. It allows to provide the turnover of the LTL cargo on the route Poland – Scandinavia in an efficient and economical way. The vital asset of our system is the acceptance of non-palletized cargo of non-standard dimensions. We created the system of 11 regular routes joining Poland with Norway, Sweden and Denmark. The transit time offered by us is competitive to the offer by global or Scandinavian operators. Among vital advantages of our service the clients appreciate the close contact and highly personalized service system. your order is taken care on its route by a designated specialist who is always available, knowledgable about the shipping status and assisting you well. price-competitive and it accepts non-standard cargoes.